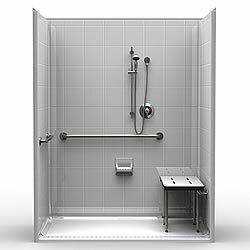 5-piece ADA roll-in shower with 8" real tile wall finish, 1″ threshold, and front trench drain. 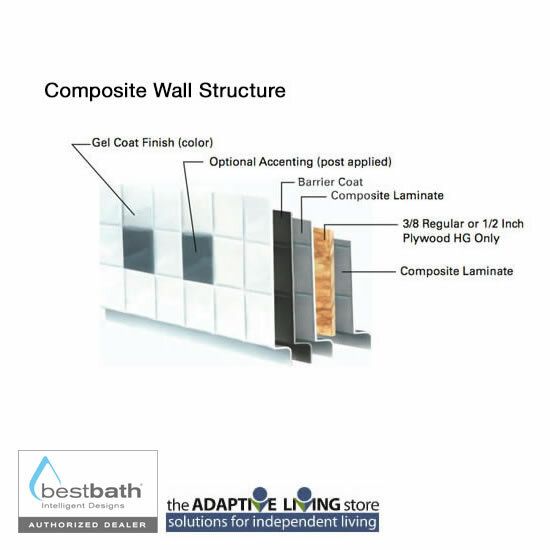 Bestbath five piece 63" x 37" ADA Roll In shower unit features an 8" real tile wall finish, 1" threshold, and front trench drain. The strong, luxurious polyester gelcoat composite fiberglass shower is multi piece for easy installation with a full plywood backing on all walls for outstanding strength and customized installation of accessories. The self-supporting pre-leveled bottom eliminates mud setting. Easy, snap-in-place installation from the front. No grout cleaning and easy care finish. No tiles to fall off. Luxurious gelcoat finish also available in custom colors or with custom accent tiles. 30 year limited warranty. 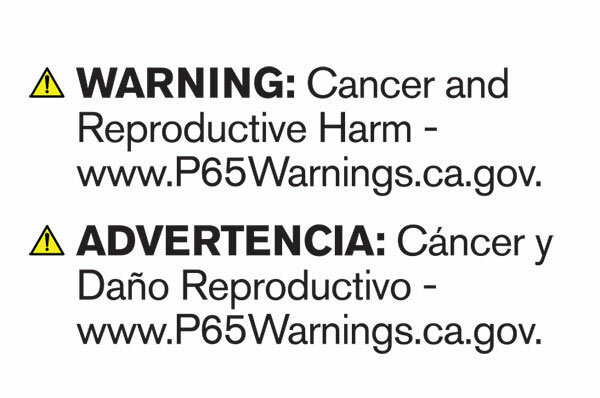 Manufactured in America. W x D x H (Outside Dimensions): 63" x 37" x 80-1/2"
LEAD TIMES: Front Trench Drain Units with Magnetic Grate ship 5 business days from processing order. NEED IT NOW Packages (WHITE Shower Unit with the Complete Fixture Package) ship within 24 business hours of order processing. White, Biscuit, Almond, Bone and Ice Grey Units ship within 3 business days of order processing. Please call for lead time on multiple units. This item is delivered via Freight. Additional freight fees may apply based on delivery arrangement needs.